A tribute to renowned journalist Naushaba Burney (1932-2016). Over 60 years ago, a young woman in her twenties walked into a classroom at Karachi University to teach journalism to a bunch of young students, most of whom were men. There were not many female students then in this newly launched institution of higher education located in the heart of Karachi. To have a woman teach men of her own age was something unusual and it could have deterred the boldest of women. For Naushaba Burney this was a challenge. She acquitted herself with grace and won many admirers. Her education abroad gave her the confidence to play a pioneering role in a predominantly male environment. Having studied at Columbia University, the University of California Berkeley and the University of Oregon, Eugene from 1953-1956, Naushaba was highly qualified for the job she had clinched. Yet, her confidence came not only from her academic qualifications. Her family background also made her what she was. The eldest of six siblings, she learnt from her mother, Nafisa, that a woman could fend for herself if she had faith in herself. That is something this young woman never lacked, even when she was in her eighties. She moved out of academia to become a practitioner of the skill she had learned and taught. Impressive positions in respected organisations followed. 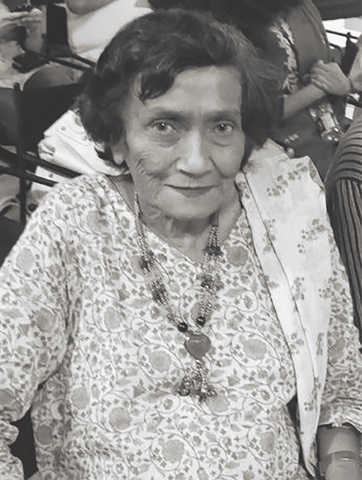 Associate Editor of Women’s World (1958-1966), International Advertising Limited, English teacher at the PACC, Editor of PIA’s in-flight magazine Humsafar until her retirement (1979-1992), in-charge of the DAWN Sunday Magazine and Editor of the AKUH Newsletter. Her final glorious contribution to the development of education in Pakistan came in 2004 when she opened a school in Korangi. There was something about Naushaba that endeared her to many people and in her quiet way she tried to meticulously improve whatever she took up. As a journalist I came to know her best when she joined DAWN after her retirement from PIA. Before that we often met at different gatherings and I found her so encouraging. She always had something kind to say and like an elder sister seemed to be keeping an eye on my work, quietly commending me for choosing the social sector to write about. Although she was senior to me in age and experience, for me she was an equal with whom I could share anything. 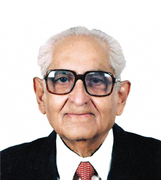 Her marriage to the outspoken champion of press freedom, Iqbal Hasan Burney (remembered as the founder and editor of Outlook) had a profound impact on her. It reinforced her audacity (as someone put it) to say what had to be said. Even the most unconventional opinion would be expressed without fear. That was Naushaba Burney, a woman who felt that social and cultural constraints should not be allowed to silence one’s thoughts. In an age when extremism and fundamentalism became the norm, I feared that her secular views expressed so unequivocally would land her in trouble. 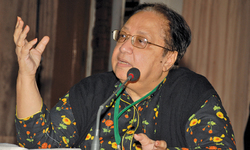 Her marriage to the outspoken champion of press freedom, Iqbal Hasan Burney (remembered as the founder and editor of Outlook) had a profound impact on her. It reinforced her audacity (as someone put it) to say what had to be said. Although she was 83 at the time of her death, Naushaba never grew old. She loved children and young people. She had to work for mental stimulation and as well as for the added income it fetched her. She enjoyed her own children and for more than a decade she worked part time until Shehryar, Samya and Samar grew up. They remember having amma frequently around when they were young with lots of support from the extended family. Naushaba was a caring mother, but she was by no means a traditional parent. Her idea of good mothering was to make her children strong and independent from an early age. Samya and Samar tell me that their mother joined PIA because it offered her the facility of free standby tickets for the family and thus she travelled around the globe in order to give her children the experience of foreign travel to fascinating lands and widen their horizons. At times it meant she was stranded in places like Nairobi and Paris on a shoestring budget with three children in tow. Yet, her spirit of adventure never deserted her. Samya and Samar recall how she encouraged them when they were older to pursue their higher education abroad and explore their interests. Strongly embedded in her was her love for young people and sense of fun. To prove her attachment to her ideals, in the last phase of her life when she had crossed the three score and ten mark she ventured out to open a school in the low-income locality of Korangi. More importantly, it had to be a good school. It must have a library. And it did. It must have sports facilities and a sports day was arranged in a stadium in Korangi with Naseem Hameed (‘fastest’ girl in South Asia) invited as chief guest. Let’s have a mothers’ club, and a meeting was called. The fame of the school spread quickly as results improved every year. At admission time applicants flocked in large numbers. The school expanded. She acquired another property for a second branch. Throughout she was at the school every day without fail. She took English classes to make the children fluent in the language. It was only in the last year or so of her life that she slowed down and left it to her staff and principal to run the school. Yet she made frequent appearances there. The youthfulness of her spirit was in full view at the Children’s Literature Festival, which she enjoyed more than a 10-year-old would. She carefully chose the sessions she wanted to attend and would make herself comfortable there in eager anticipation of what was to come. There are many who will miss her warmth, unassuming nature and her wise advice which she gave freely. Ameena, a successful publisher in Pakistan, recalls the support she received from her sister throughout her life. “I was in school and our class had been introduced to Shakespeare. I was struggling with the language and not succeeding in deciphering it. Those lessons went a long way in Ameena’s rise to the top of her professional life. There are many who will remember you Naushaba.